SEATTLE — The award-winning Israeli documentary film “Censored Voices” tackles one of the most freighted myths of the Zionist ethos: Israel’s “miraculous” victory in what was once called the Six-Day War, the June 1967 conflict with Egypt, Jordan and Syria, which resulted in Israel’s conquest of the Sinai, Golan, East Jerusalem and the Occupied Territories. The film was screened at the prestigious Sundance Festival and had its U.S. premiere at New York’s Other Israel Festival earlier this month. It will open its U.S. engagement in New York and Los Angeles on Nov. 20, but as the old saying goes, history is written by the victors. As glorious as Israel has made its victory sound, the accounts of the soldiers who lived through the war reveal a different story. In June 1967, as Israeli military victories in Sinai, the Golan and West Bank made it clear that the nation would win a blitzkrieg war against its Arab enemies, a collective euphoria took hold of society. People naturally ascribed the nation’s sweeping victory not only to its fighting men or their military prowess, but to a mystical force that guided and protected the enterprise. According to this notion, God chose Israel to win this victory. This divine endorsement sanctioned an expanding series of national goals, including the absorption all of the ancient Israelite sites in Palestinian East Jerusalem and the West Bank into Israel proper. As a result of this process of religious triumphalism, the settler movement — a religious-nationalist campaign to return to the nation’s biblical roots in ancient Israelite lands — was born in 1968, mere months after the war ended. By resettling these historic places (many of them in Palestinian East Jerusalem and the West Bank), many Israeli Jews believed they would hasten the Redemption, the coming of the Messiah. Though the movement had a largely religious underpinning, even secular Israeli nationalists were swept up in its fervor. Amidst this nationalist fervor, a small, select group of kibbutznik officers decided to take a much different tack. They gathered together to record their reminiscences of the war not in order to lionize their heroism, but in order to question the underlying assumptions of the war and their participation in it. They did so haltingly, reluctantly, knowing they were violating the national consensus. They also knew that some of their experiences flew in the face of the national mood, since they documented serial massacres of surrendering Egyptian soldiers and unarmed civilians. At that historical moment the Israeli Defense Forces was a national treasure. Its combat soldiers were Golden Boys who fought with pure, virtuous motives and came home redeemed from their ordeal in battle. Another concept that reigned in that era was tohar neshek (the “purity of arms”). This was the principle that because Israel’s mission of creating a Jewish homeland was morally righteous, the battle to ensure its survival must be fought in a morally just way. However laudable the general principle might’ve been, it was deeply pernicious in practice, as it could never be realized. That, of course, did not stop Israel’s advocates and military from maintaining this false principle over the decades, even into the present day. During every Israeli war its public relations officials trumpet the morality of Israel’s war-fighting tactics. Amos Oz sits infront of one of the tape recorders use to record soldier’s testimonies for the documentary film, Censored Voices. The goal of Amos Oz, then a rising young novelist, and Avraham Shapira was to have soldiers tell their stories in their own words. Though it was a relatively simple concept, it was quite radical for its day. The discipline of oral history was not yet known. Breaking the Silence, an NGO which gathers oral testimonies from Israeli soldiers to document potential war crimes, was decades away from being founded. Then, Israel was very much a top-down society in which leaders led and soldiers and citizens followed. The media dutifully reported what the leaders told them to. Musicians wrote songs to aid the patriotic project. Everyone knew their place and did their respective jobs. Into this national idyll strode these starry-eyed idealists who rejected key elements of the narrative being fed to the people. They did so with some trepidation, but they were convinced that their views would receive at most a limited hearing within their own kibbutz movement. What they didn’t take into account was that in that era the kibbutzim were considered among the national elite. Cultural, artistic and political developments which began on the kibbutzim later swept through society as a whole. Outside Israel, anti-war sentiment raged in the United States and elsewhere against the Vietnam War. Though American Jews shared the jubilation of their Israeli brethren at the victory in the war, many also had a vague sense of foreboding instilled by cynicism toward the unmet goals and general carnage of the Vietnam War. In the title chosen for the English edition, we can begin to see the transformation of a small act of rebellion into an act of liberal hagiography. The “seventh day” refers to the six days of creation and God’s seventh day of rest. This conception of the war accords divine status to Israel’s victory. Israelis, like God, labored for six days on the battlefield. By the end, they had, like God, created a miraculous New World, a state onto which Israel strode victorious and seemingly invincible. Another bit of delusion conveyed by the title, was that the war was now in its seventh and final day. It was over. Israel’s existence had been secured. It could now rest. All the rest involved a mere sorting out of events into a proper narrative context. The future for Israel seemed secured and bright. Some of the soldiers whose thoughts were recorded knew this was a false belief. They had seen the faces of the expelled refugees whose villages were destroyed for no good reason. They knew first-hand that these people were not done with Israel. They knew there would be a reckoning at some point in the future. So in this sense, “The Seventh Day” became, almost in spite of itself, a piece of liberal pro-war propaganda. It enabled liberal Zionists both inside and outside Israel to speak of the fine young boys whose consciences were stricken by what they had done and seen and heard on the battlefield; young men who had nevertheless done their duty by the nation. What more ennobling thing can there be than a hero forced to do things against their individual conscience on behalf of saving the nation itself? It’s a drama almost equal to a Greek tragedy. In a sense, Oz and Shapira became prisoners of their own success. Oz went on to become Israel’s leading novelist, the conscience of his country. He became an ambassador to the world, personifying Israel’s moral conscience amidst conflict and injustice. He was always good for a journalist’s quote during Israeli wars. He would speak of moral anguish and two peoples both equally right. All the while, the Israeli war machine was pursuing its own agenda with massive firepower and fury, and the support of foreign military powers like France, Britain and the U.S. which provided much of this war matériel. Perhaps without even realizing it, Oz became the moral fig leaf for occupation. How could anyone call Israel immoral or unjust when it had such a figure inveighing like a biblical prophet against it? Who censored ‘Soldiers’ Talk?’ The army, the editors, or both? If Mor Loushy, the director of “Censored Voices,” would’ve adopted a more critical attitude toward Oz and Shapira, it would’ve made for a more probing historical judgment of their efforts. An example of this concerns the issue of self-censorship versus official censorship. Loushy calls the film the “uncensored” version of history, noting that the IDF military censor excised 70 percent of the original material in order to protect national security and/or morale. Now, Loushy tells us, the full story can be told. She makes viewers feel like the righteous ones who can now understand for the first time the real truth about this war. But Loushy’s film omits a critical element in shaping the narrative of “Siach Lohamim.” Shapira and Oz both made editorial choices which excised certain voices or perspectives from the book. First, participants had suggested moving outside the kibbutz circle to record Orthodox soldiers who’d fought in the war. But when Oz heard the perspective they offered, which raised none of the moral questions felt so deeply by the kibbutznikim, he railed against it. In order to preserve peace within the group, Shapira removed the material falsely claiming there had been “technical issues” with the recordings. ”In order to suit the words to the image of innocent young soldiers, humanists in distress … the editors were careful to avoid distancing the speakers from the national consensus—rather, they did just the opposite, placing them at its forefront and center. In doing so, they both shielded Israel from the most disturbing accounts and permitted the nation to continue nursing the prevailing narrative of heroism and sacrifice which the war invoked in popular consciousness. If they had told the story in all its gory details, it might’ve woken up more Israelis more quickly to the vanity of war and occupation of Palestine as solutions to Israel’s predicament. Instead, in these recordings we hear individual confessionals which have little practical moral purpose or effect. None of them went beyond their own personal quandary to question the entire system that ordered them to war. None rejected the summons to battle. None succeeded in creating a political movement that would undo the injustices they perpetrated and witnessed during the war. This is why Israel remains in the state of limbo it believed it’d extricated itself from after the end of the 1967 War. In hindsight, we can ask why they didn’t object more strongly if the official censor cut the guts out of their book. Why didn’t they fight? Why didn’t they launch a public campaign? Of course, times were different then. Israelis were more trusting and less cynical than they are now. They didn’t fight the system to the degree they might now. Yet one still can’t help but wonder whether things could’ve been different today if a more honest, searing portrait had been presented to the Israeli public 50 years ago. “She [Loushy] was deep into the project before she discovered that the film, too, would be subject to censorship, she said. In an interview, Loushy told MintPress News that when the censor saw the footage, he wanted to remove significant portions of it. But she and her producing partner, Daniel Sivan, fought back. They hired a lawyer who specializes in free speech law. He argued strenuously for the restoration of all the censored material. And, according to Loushy, they won. In the end, the censor didn’t bowdlerize this film as it did the 1967 book. Some things do change for the better. “We were told to ‘evacuate’ civilians. What we did was to take this Jew [sic] … this Arab uproot him from his village and turn him into a refugee. You simply banish him. And not just one or two or three. Evacuation. And you see this entire village sitting there just like in those images you saw with your own eyes [of Jewish refugees during the Holocaust]. When you have to tell this village something in order to drive them away, you tell them in a little while they’re coming to bomb it [the village] and that they ought to leave. But they tell you, and not one, but three or four or seven of them: ‘That’s all right, let us die here.’ You have nothing to say to these folks. When you see an entire village go like sheep wherever they take them. And they make not even a shadow of a sign of opposition, you realize what ‘Holocaust’ means. “If there was a moment of recognition of World War II and the Holocaust, it was when I was driving into Jericho and saw the refugees leaving on the road below me. I identified completely with them. I could see myself in those kids carried in their parents’ arms, like when my own father carried me. These are the sorts of rare epiphanies few other participants experienced to such dramatic effect. The more common response among the soldiers was that of the individual who said: “Our presence here involves expelling Arabs. Zionism is a tragedy. But should I cry over those expelled? No.” While acknowledging Zionism was built upon a moral conundrum, when push came to shove he would never permit these exiled Arabs to return. Rectify the moral stain through restorative justice? Not in a million years. Like the Israeli historian Benny Morris, who earned his reputation as an exposer of Zionist myths until he became one of their foremost defenders, the soldier’s account (partially quoted above) noted that while Zionism is rooted in sin, it was fully justified because of the greater good of saving the survivors of the Holocaust. Among the most riveting of testimonies are the two which document mass killings of Egyptian soldiers and Syrian civilians in the Golan. In the latter case, a soldier-witness describes a patrol in which he met shepherds traveling on the road back to their homes to take a few personal belongings before continuing their trek eastward, toward refuge in Syria. He met one such group and inspected them and found them unarmed and allowed them to proceed. The soldiers proceeded to other business, and when they came back an hour later to a spot near where they had first met the group, he found a different army unit which stopped the group again. These soldiers separated the men from the women and children, who they told to proceed on their journey with their chickens, donkeys and other possessions. As soon as this group walked 100 meters eastward the soldiers shot the 15 men dead. They grabbed one man by the hands and feet and threw him over a stone wall. Loushy also offers accounts from soldiers who witnessed executions of Egyptian soldiers in the Sinai. Some were armed and some unarmed. But even the armed soldiers offer no resistance or threat. They were too dazed and dehydrated to pose any threat to anyone. Nevertheless, they were gunned down. Another common rationalization of the soldiers that made them feel better about their participation was the claim that the war was initially just, a means of defending Israel from destruction. But that once it became a war of conquest in which acquiring territory — Sinai, East Jerusalem, Golan, the West Bank — became a foremost goal, it lost any justification. The historical truth is that Israel’s leaders in 1967 had little reason to believe Gamal Abdel Nasser, the president of what was known then as the United Arab Republic and known today as Egypt, actually intended to attack them. In fact, Nasser appeared to anticipate that Israel might attack him. Egyptian forces were entirely unprepared for the Israeli attack, explaining why they were routed so easily. Its air force was unprotected and fully exposed to Israeli attack. Given these circumstances, it is debatable whether war was inevitable or whether Israel’s attack was justified, making the sacrifice of these men recounted in “Censored Voices” entirely without purpose. There are several astonishing omissions in both the original book and the testimonies recounted in the new documentary. Though the war veterans talk about the period during which they were mobilized and the period of waiting before the war, and the onset of the battle, they never address a key political issue: Why did their leaders order them to attack? Was Israel’s attack justified as pre-emptive? Or was this a war of choice? A war of aggression? Did it in any way change the moral calculus of the war itself? None of the soldiers notes that initially Israel claimed the Arabs attacked first, which was a lie. Nor did any of the participants fundamentally doubt their participation in the war. Though one soldier admitted to hoping he would not be called and said he would’ve been just as happy to avoid the fight, no one harbored reservations serious enough to consider refusing to serve. It was an assumption common to all that they must fight for the collective good of the state. When it called, they would be ready regardless of their personal doubts. One interviewee appears to speak sensitively about his refusal, after serving and witnessing what he did, to ever steal any more land from anyone. The truth is that Israel has stolen land from the Palestinians and Arab states since 1948. The 1967 War was but one chapter in a decades-long history of theft. Nor did the stealing end in 1967. It has continued until the present day. There is a great deal of this quasi-moral amnesia among these survivors of war. They appear to bear their souls. They speak unpleasant truths. They show themselves to be thoughtful, decent human beings. But their sensitivity goes only so far. And then it ends in a brick wall of national self-justification. A refusal to consider fully the consequences of the actions of an entire nation in robbing the Palestinians of their patrimony. 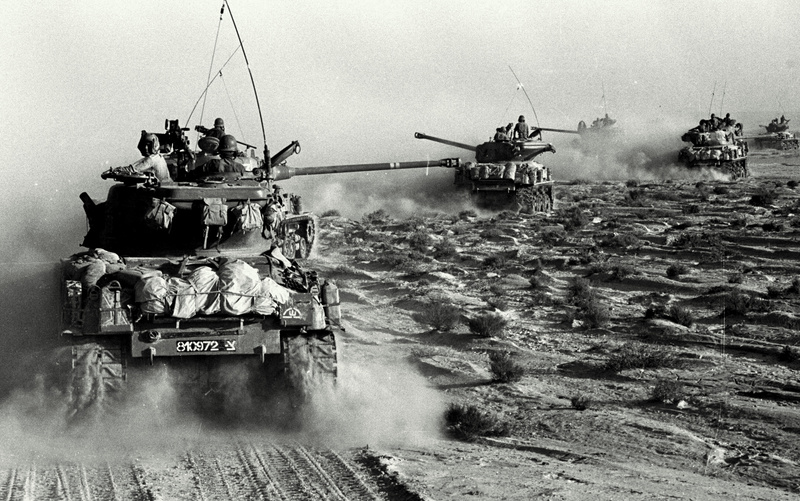 In 1956, Israel, along with its French and British allies, chose to wage war against Egypt. This conflict was known variously as the 1956 War or the Suez Crisis. Their attack amounted to an act of aggression — one which President Eisenhower objected to so strongly that he demanded that all parties immediately evacuate and restore their territorial gains to Egypt. An estimated 200,000 Palestinians were forced into exile and another 13,000 to 23,500 noncombatant Arab soldiers and civilians were killed. But this was not a one-off phenomenon of the 1967 War. It was but one in a long line of such acts going back to the Nakba of 1948. It continues today in the form of the ethnic cleansing of Palestinians in East Jerusalem and the West Bank, the ongoing theft of their land, and the murder of unarmed Palestinian civilians. Israel’s military history since this earlier period has offered more of the same acts of outright aggression against the Palestinians and other Arab states. Israel is a nation that vastly prefers the use of force to the use of diplomacy. It resorts to force at the first opportunity, then does its best after the fact to articulate its actions as defensive and necessary to preserve the nation’s existence. This is the Zionist myth of eternal victimhood and existential necessity.